The summit is open once more, but is it enough to bring back visitors? The sky was a brilliant blue and the crisp air of early autumn filled the lungs of those stepping out of their vehicles that September morning. Conditions were perfect for mountain climbing. Inside the ropeway cars there was cheerful chitchat, some hikers carefully adjusted their kit while others stared out of the windows as Nagano Prefecture slowly spread out like a sea of green below them to the east. Stepping out into the fresh air high up the mountain at 2,150 meters, there was only the sound of the wind and birdsong, the faint creaking of the ropeway soon left behind as hikers followed the trail that snakes through the trees up toward the barren summit plateau of Mount Ontake. Then, just before midday, the top of the mountain exploded with a searing fury, act one of what would become Japan’s deadliest postwar volcanic disaster. 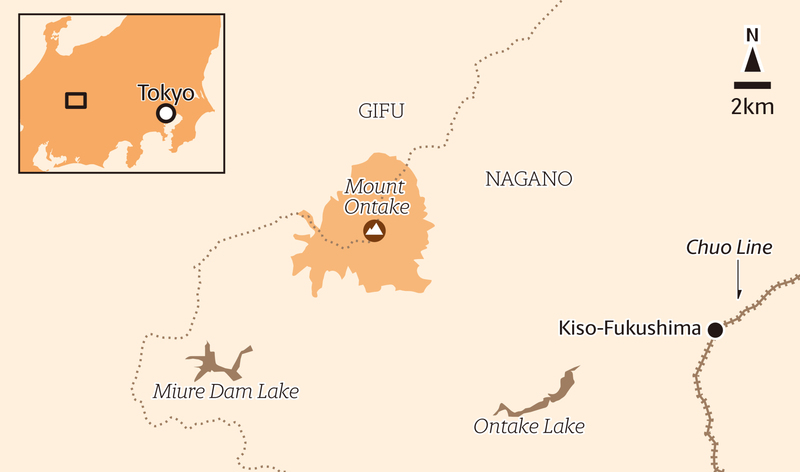 At 3,067 meters tall, Mount Ontake is the 14th-highest mountain in Japan, and the second-highest volcano after Mount Fuji. Its awesome mass straddles the border of Gifu and Nagano prefectures around 100 kilometers northeast of Nagoya, and it has long been regarded as one of the country’s most sacred mountains. 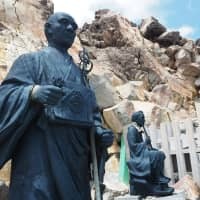 For a millennia and more, mountain ascetics and pilgrims have traveled from far and wide to scale the peak, with shrines and teahouses popping up along the various approach routes. Even until the morning of the eruption, it wasn’t uncommon to see modern-day yamabushi (mountain ascetics) making their way to the summit, clad in traditional white garb and clutching a pilgrim’s stick and conch-shell trumpet. Since the hiking boom of the 1980s, Ontake has attracted another kind of devotee, the mountain climber, and the almost perfect conditions on that sunny late September weekend in 2014 meant that hundreds of people were on the mountain when it erupted without warning. At 11:52 a.m. on Saturday, Sept. 27, groundwater that had been superheated by magma evaporated, expanding in the process and causing a sudden and violent explosion of rock, steam and ash from the summit of the mountain. This type of eruption is known as a phreatic eruption; a very rare occurrence and difficult to predict or detect. As the skies filled with burning ash and a great gray cloud billowed down the mountainside, hikers ran for their lives. Some managed to reach the relative safety of the mountain huts, cowering inside as staff scrambled for helmets and called for help. Those closer to the summit weren’t so lucky. In the following days and weeks, rescuers sifted through the ash and mud, exhuming the bodies of those who had fallen, although with the onset of winter the work wasn’t completed until the following summer. A total of 58 people were killed in the eruption, with five people still remaining unaccounted for, their bodies now part of the mountain that took their lives. 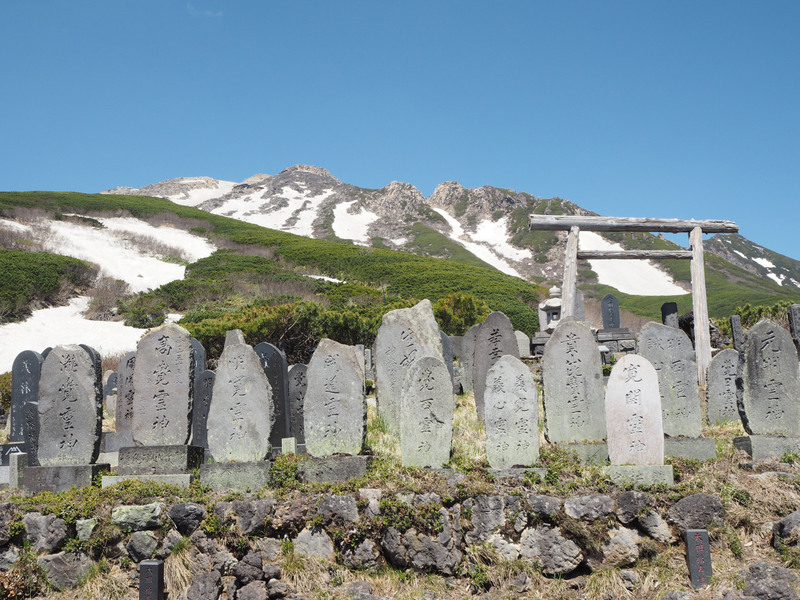 A stone memorial has been built in the small village of Otaki near the foot of Ontake. At Kaida Kogen campsite to the east of the peak a local woman says that ryokan (Japanese-style inns), hot springs and other small businesses around the mountain have seen a vast downturn in visitors since the eruption, but there is hope that with the re-opening of the summit, things will eventually return to normal. For the people who lost loved ones, however, things will never be the same, with some families filing for damages against the Japan Meteorological Agency who, it is claimed, failed to issue adequate warnings despite an increase in earthquakes on the mountain prior to the eruption. It is now four years since that fateful day, and early this summer I decided to climb Ontake to see how things had changed. When I visit, the 1-kilometer exclusion zone remains in place around the summit but most trails are open as normal. It is a perfect weekend for hiking, with blue skies, gentle winds and just the slightest hint of an early morning chill, much like on the day of the eruption, I imagine. However, it soon becomes apparent that things are now quite different. At the base of the Ontake ropeway, the huge parking lot is almost empty, with only a handful of vehicles lined up next to the building. A few staff mill about the complex, getting ready for the visitors who will likely never appear. Announcements echo down the corridors and the shutters of the souvenir shop squeak as they are rolled up, revealing a spacious interior full of Ontake-themed cakes, T-shirts and keychains. At the counter, a shop assistant rearranges the already perfectly aligned postcards that are on display. I buy a pin badge, half out of pity. There is another announcement to inform the half-dozen hikers that the ticket window is now open, and a short line forms as we wait to board the first ropeway cars of the day. That was as busy as it ever got. From the top ropeway station the path meanders through pristine woodland, and it is a steady climb beyond the tree line to the Nyonindo hut. 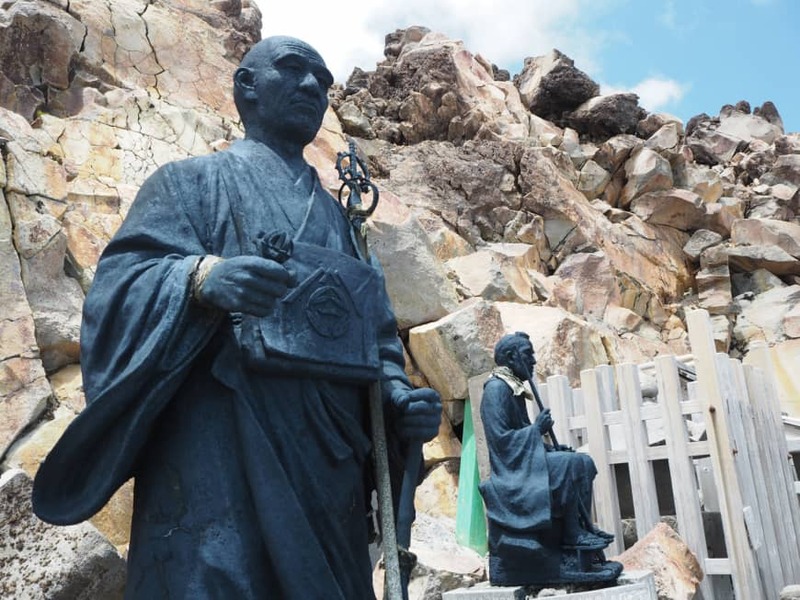 Huddles of stone statues and wooden torii gates remind me of the mountain’s sacred stature, but even the yamabushi are nowhere to be seen today. I carry on climbing up the slopes over late-season snow patches as the bare and craggy summit draws nearer. A large stone torii gate lies forlorn on its side, presumably a victim of the eruption and broken in two by a direct hit from a huge boulder lying close by. 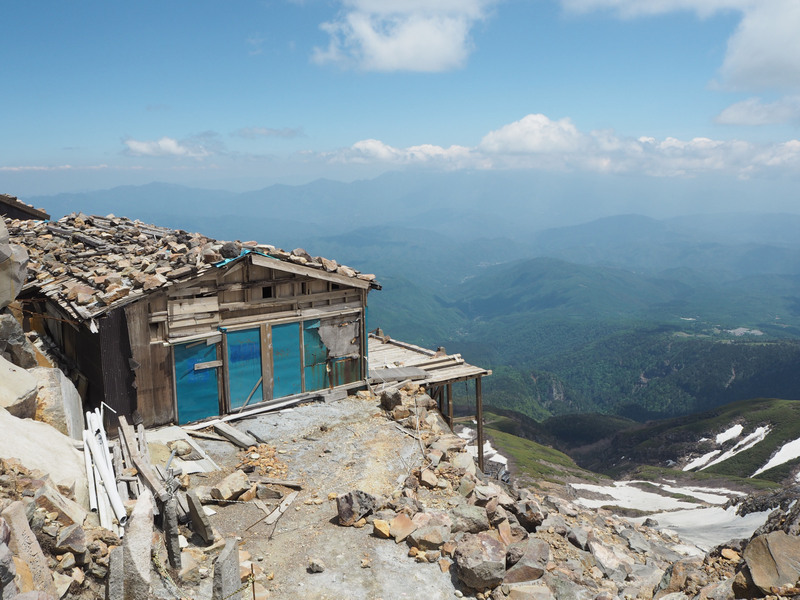 At the Ishimuro hut, just short of the summit, the owner tells me that he sheltered people as they ran down the mountain that day, faces gray with shock and coated with ash. I’m surprised to see the hut is open for business at all this early in the season, and the cheerful owner admits that they rarely get more than a handful of guests at night, even on weekends. The last part of the hike up past the hut is steep and rocky, and the mountain finally begins to look and feel like a volcano. 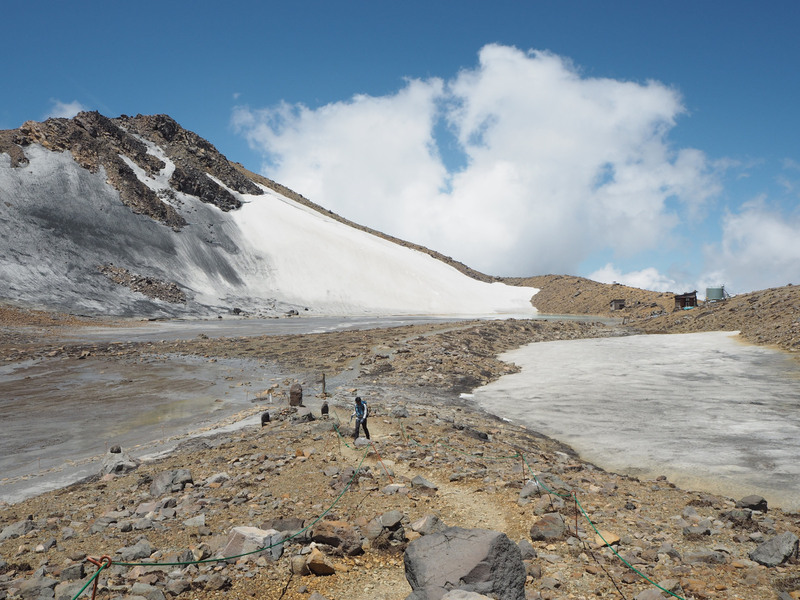 A rope blocks the trail leading to Ontake’s true summit, known as Kengamine and lying within the 1-kilometer exclusion zone, but hikers can freely explore the mountain’s other minor peaks which sit among a unique, stony landscape dotted with alpine flowers and milky blue-white crater lakes. The ash-stained summit area has an eerie and otherworldly yet devastating beauty, but the air is quiet and somber. It is at once both easy and difficult to imagine what happened here. The summit opened on Sept. 26, almost four years to the day after the disaster. Whether people return is yet to be seen, but for now and as always, Mount Ontake remains a deeply spiritual place and a stark testament to the powerful forces of nature. All volcanic peaks in Japan are carefully monitored by the authorities, but as was the case with Mount Ontake, even the experts can be taken by surprise by sudden eruptions. Some of the most popular hikes in Japan are up the slopes of potentially active volcanoes (this includes Mount Fuji), so the risk of being caught out, while very small, is nonetheless a real one. When climbing up or near volcanoes, always pay close attention to official warnings, signs and announcements. Carry a flashlight, and if possible, eye goggles and a small radio. Always be aware of your surroundings and know your escape route if there were to be an eruption. If you are in the immediate vicinity of an eruption, leave immediately and seek cover. Avoid gullies, rivers or anywhere downstream of the eruption. Look out for flying rocks and ash, and use a mask, bandana or damp cloth to cover your nose and mouth. There are a number of hiking routes up the mountain, the most direct of which is the Otaki-guchi Trail starting from the top of the gondola at the Ta-no-Hara trailhead. However, the only trail with access to the summit is from the Ontake Ropeway (open late April to early November). There are a small number of daily buses to both trailheads from JR Kiso-Fukushima Station on the Chuo Main Line during the summer, and at weekends only from July to October.